Starring: Suriya, Nayanthara, Ramesh Kanna, Vadivelu. The biggest of this festival season is here and it comes with great expectations. Suriya is targeting a hat trick of hits while KSR is all set to follow up the Dasavatharam phenomenon with another big grosser. Have no doubts when you enter theaters, this is a trademark KS Ravikumar product, no holds barred entertainment with elements for just about everyone in the family. But, it does also come with its share of pitfalls and flaws. A professional assassin, sharp shooter, jet setter, high flyer – that’s how Aadhavan (Suriya) is introduced to the audience. The customary introduction song does not actually set a racy tempo, but is still foot tapping. He never misses his aim and that brings him a big assignment, one that promises crores. 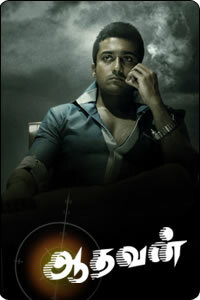 A judge all set to report his findings on a sensational case is the target and Aadhavan is ready to shoot. The bullet misses, the judge survives, Aadhavan fails. With crores and a huge reputation to protect, Aadhavan vows to complete the unfinished job. How, when, where? Watch Aadhavan to find out. The basic premise of an assassin and the target must lead you to think of a suspense filled, tense and intense plot. But what you get in the first half is exactly the opposite . You are introduced to a large joint family, Saroja Devi (on screen after 12 years) is the eldest member and Nayanthara as Thara is her granddaughter. Vadivelu is the domestic help and at the helm is the Late Murali who wields the whip and a stentorian tone. Suriya joins the mix and you are in for a hilarious one and a half hours. Trust KSR the script writer to blend and infuse comedy into any story, he does it with finesse here and executes it to near perfection as a director. Ramesh Khanna joins in later to add to the humor quotient. While the main plot does keep moving throughout the first half, it is only close to the interval that it takes a decisive twist. Post interval you are told the details of an unknown identity, a flashback narrates a few family relations and the reasons for an old wound, before we cut back to present to resume the main plot. By now, the pace has slackened a bit. A little bit of romance is slipped in, but it has been kept in check which helps the main plot maintain its course. The last half an hour is perhaps the weakest portion of the movie. Even though the events unfold at a pretty steady pace it fails to engage the viewer. The climax, in an isolated yard with a crane, fully filled petrol tank and a pond nearby are typically Kollywood masala fare. It definitely could have been better. In the bid for uninhibited entertainment, logic and reason have taken a beating at places. Though that is not uncommon in cinema, those instances do leave you searching for explanations. The most prominent is the scene where Aadhavan opens up about his identity to Thara- How Madhavan became Aadhavan? Later, when it is opened in front of the whole family, everyone seems to swallow whatever has been said without even a shadow of doubt. But, KSR has managed to a large extent to cover up for the lack of clarity at places with his racy direction. In fact, you might find yourself asking questions about the logic behind many incidents well after you have left the theater, not while you are still watching the film. Other dampeners include the placement of songs, especially in the first half. The ‘Dekho Dekho’ number seems unnecessary and extraneous to the script. ‘Yaeno Panithulli’ and ‘Hasili Fisili’ captivate with the visuals and exotic locations. Technically, Aadhavan has got few things to boast about, presenting Suriya as a 4 feet something tall 10 year old boy must be a first in Tamil cinema. Though one can clearly make out that it is graphic patchwork at quite a few instances, overall it is a job very neatly done, great effort. Camerawork by R Ganesh is adequate. It is only in the above mentioned songs that he gets to translate a rich feel onto screen. Harris Jeyaraj’s music which is already a hit could have been placed and used better, the songs would have served as a bigger strength to the film that way. Suriya walks through a role that does not challenge him much. The effort and risks taken in the fight sequences, especially the first chase through Kolkata where he can be seen jumping over rooftops etc.., tell a lot about commitment. He looks stylish, angry, cunning and innocent while bringing out different shades of the character that he portrays; a well crafted performance. Nayanthara escapes the glamour trap after a long time and looks fresh. Saroja Devi brings in some old world charm to the proceedings while Murali is authoritative in what is sadly his last film. Sayaji Shinde, Rahul Dev, Riyaz Khan and others do a fairly neat job. Anandh Babu belies the years to shake a leg in the opening song and passes off quite well in a limited but significant role. Vadivelu brings the house down with his comic act. He breathes life into the proceedings every time he is on screen and his antics keep the first half brimming with positive humor; his character adds to the overall Aadhavan experience. On the whole, Aadhavan is trademark KSR cinema. It has action, comedy, sentiment, romance, music and masala, not to forget his special appearance at the end. There are flaws, missing pieces, loose ends and a stereotyped climax that might put you off, but commercial cinema is always prone to such errors. If you are not a stickler for logic or substance, there are quite a few positives to sit back and enjoy.